Sometimes life gets a little crazy. Sometimes life gets a lot crazy. And sometimes, life just gets too busy to really plan ahead efficiently. That has been my life as of late. With the tedious and long hours spent doing my physical therapy stretches, and being in enough pain that it hurts to stand for long periods of time (sitting down isn’t always better), sometimes simple and hands off is what you need. Thank goodness while out at Earth Fare one day, I snagged a can of Eden Foods cans of rice and beans. It was on sale, as I recall, and I figured it was never a bad thing to have some sort of canned meal or side on hand…just in case. Last week, it sure was a lifesaver when it came to lunch one day. My weeks have been stressful and I’ve been battling my own little injured runner demons. Sometimes, motivation to really do anything is lacking. Sometimes, when I get home from work, all I want to do is collapse and not move for awhile. But, usually, I have lunches and snacks to prepare for the following day, and then dinner for that evening to get going on top of it all. I reached a breaking point last week and I was so happy to find this can of rice and beans in my pantry. Like…seriously happy. Who knew a canned good could bring so much relief and joy? 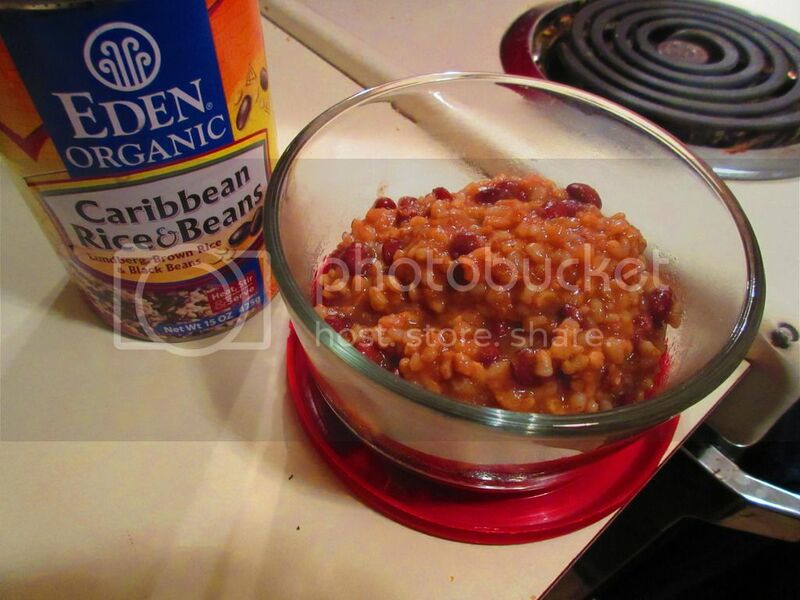 Eden Foods Caribbean Rice and Black Beans is a really simple food to prepare. Simply, open the can, and heat. I used the stove top method, which involved putting it into a saucepan and warming it through. I stirred it throughout the cooking period, and then dished it up into two (one for me and one for my roommate) Pyrex containers for the following day. While it was warming, I was working on dinner. It was the best feeling ever to accomplish two things at once without any additional stress or steps. The next day, I small reheat in the microwave was all that was needed. Lunch…was served. The Eden Foods Caribbean Rice and Black Beans was decent enough. While I appreciate the BPA-free can and the low sodium, this dish was actually under-seasoned. I had my roommate take a taste before I packed it up for lunch and she said it needed a hit of salt. She’s a sodium-scardy-cat, so this was quite the surprise to hear. I took a pinch of salt from my dish and added it, giving it another stir. And she was happy enough with that. It still was bland on it’s own, however, we both concluded that this would be the ultimate vegetarian burrito/taco filler. In fact, I sort of want to buy another can and have taco night. There wasn’t much heat in the spices, despite including cayenne pepper in the seasonings that go into this particular blend of rice and beans. But, this meant that we could season and add as much spice/heat as we wanted individually. I left it as it was, as I didn’t have my bottle of Cholula with me that day, nor any bereber or red pepper flakes. So, yeah, on its own it was more than a little disappointing. If it had been part of Taco Tuesday or something…it would be amazing. While I was expecting a little more heat, it was very mild on the palate. Not great, but not bad either. I’d purchase it again for tacos…but not to have on its own. Let’s talk about what goes into the Eden Foods Caribbean Rice and Black Beans, shall we? This product is made up of water, organic Lundberg short grain brown rice, organic black turtle beans, organic onion flakes, organic paprika, organic garlic powder, sea salt, organic cumin powder, organic cayenne powder, and organic cinnamon powder. This product is gluten free, kosher, and cholesterol free. Nutritionally speaking, however, you’ll love the facts on the Eden Foods Caribbean Rice and Black Beans. One serving is 1/2 cup and there are 3.5 servings in a can. A serving will provide you with 120 calories, 1 gram fat, 100 mg sodium, 230 mg potassium, 23 grams carbohydrates, less than 1 gram sugars, 4 grams of fiber and 4 grams of protein. It is filling and healthy for you. It will definitely do your body good. I just wish it had a bit more…flavor to it. Anyway, while not wowed by the product, as stated, I would probably purchase another can of the Eden Foods Caribbean Rice and Black Beans for other purposes, aside from being eaten straight as my roommate and I did. Decent food, that will keep for awhile, at a good price…sometimes that’s good enough. If you do try these out…check the seasoning and spice levels. You might want to add to it. This entry was posted in Beans, Clean Eating, Entree, Food, Gluten-Free, Products, Review, Rice, Side Dish, Vegan, Vegetarian by The Celiathlete. Bookmark the permalink.